Templeton students perform in Youth Honors Band - Hamilton School District. 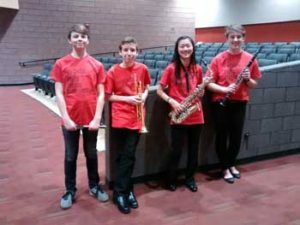 Four Templeton Middle School students performed Jan. 14 in the Wisconsin Youth Band Directors Association (WYBDA) Honors Band concert held in Pewaukee. Jacob Hubred on percussion, Ian Markano on trumpet, Maja Pechanach on clarinet, and Mia Traverse on alto saxophone, joined students from 80 top middle schools statewide. Templeton band director David Neubauer nominated and prepared the students and Hamilton High School assistant band director Jill Casper was a guest conductor and sectional coach for the day. WYBDA is an organization for beginning and intermediate level band instructors from across the state of Wisconsin.